Orlando Valenzuela’s Miliciana de Waswalito (1984) is a photograph of a woman in Matagalpa, Nicaragua. It was taken during the Sandinista Revolution, which was also known as the Contra War. This revolution was a result of the dictator, Anastasio “Tacho” Somoza Garcia. The dictator caused dissension by allowing only himself and his close friends control over alien businesses, not keeping promises made during his campaign, driving the country into debt, and finally by detaining 500 students who were part of a non-violent protest against his re-election (Truman). To end Somoza’s dictatorship, which was supported by the U.S., many Nicaraguans joined the Sandinista National Liberation Front (FSLN) under Carlos Fonseca Amador (Turman). The photograph was taken by Valenzuela, the editor and photographer of the Youth Boys magazine. Later, it was so famous it became the image of the World Solidarity Campaign Nicaragua. 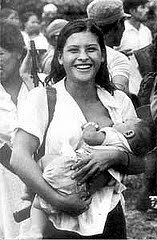 This photograph captures a moment in which a woman represents her position as both a soldier and as a mother of the Sandinista Revolution. This photo is of a woman carrying out two tasks at once: she is nursing a young baby and carrying a gun over her right shoulder. Behind her, the commotion and turmoil of the Contra War continues on; however, she calmly proceeds with her job, which is to act as a mother and a fighter. The placement of the child and the gun show there is an equal balance; one duty does not outweigh the other. The woman in the center of the photograph is significant because Valenzuela hoped for her to be the only focus of the photograph, allowing the viewer to observe the gun and the child. Another factor that shows this focus are the colors of the photograph: black and white. This style draws people away from small details, and instead to the bigger, more important objects of feminism. This photograph is clearly Nicaraguan propaganda that demonstrates society’s acceptance of a female's ability to take on two very different roles. The woman in the painting is a symbol of the coexistence of these diverse jobs. Although she is shown fighting in war, the mother remains loyal to her conventional duty—caring for her baby. The photographer displays that females are capable of male's jobs, even the most extreme tasks such as fighting in war. Moreover, their obligation to the tradition of raising and nurturing children is still revealed. Valenzuela makes people aware of the fact that women are still feminine when doing masculine feats. The photograph shows that in times of war a woman does not need to be completely masculine as Rosie the Riveter implies, and she does not need to lose her femininity to the gun. The tragedy of children born into armed conflict is also evident for those who ponder the proximate scenes. 50,000 or more Nicaraguans died in this proxy war of the United States government. No amount of gender equity can erase the evil perpetrated at first by the US. government and then by the rogue U.S. officials such as Oliver North who continued to kill Nicaraguans in direct defiance of U.S. law. They were never punished for those crimes. I have this poster and I always wonder what happened to this woman and her child(ren). Hello, where did you get this poster? Artists use propaganda to influence viewers’ feelings and beliefs on a specific subject. In this blog, you will discover and learn about the theme—femininity of women expressed through propaganda during times of war. Within this category, women are represented in two different ways: some artists have a feminine approach and value the traditional duties of women in war, whereas other images exhibit women as powerful and capable of taking over a man’s profession. Rosie the Riveter by Norman Rockwell, Miliciana de Waswalito by Orlando Valenzuela, Enlist by Fred Spear, Destroy this Mad Brute—Enlist by H.R. Hopps, and Keep These Hands Off by Gordon K. Odwell all follow the relative norms of society to convey the artists' view on women's femininity. Link to "Female Roles Through Art"
Camille’s blog “Female Roles Through Art” explores the progression of female roles in society from the washhouse to the work force. The blog fights the typical stereotypes on women and shows the strength and power of the female gender. This blog relates to “Femininity in Propaganda” because femininity is relative to women’s roles. The first artwork in the her blog, The Washer Women by Abram Efimovich Arkhipov, was painted in 1899 and therefore the women in the image were portrayed as feminine. The women are working in the washhouse, as they are only allowed to do traditional work. This is similar to Enlist by Fred Spear and Keep These Hands Off by Gordon K. Odell, two paintings whose primary focus is traditional work; however, instead of women working in the washhouse, the women are caring for children. Nevertheless, women’s roles of the time shaped the artists idea of how “feminine” a woman should be. The image Rosie the Riveter (1943) by Norman Rockwell was used in both blogs. In “Female Roles Through Art” the artwork is used to show the increase in women’s power; in other words, women are not seen as solely feminine, but are now accepted in a man’s profession. Women’s roles directly affect how feminine women will be viewed by artists and the outside world. Link to "Women and Children in War"
This blog is very similar to Joy’s blog "Women and Children in War." "Women and Children in War" focuses on the people behind the scenes of war, those who are generally overseen due to their “inability” to fight: women and children. The artworks concentrate on the emotions of women and children, as well as a mother’s obligation to her children when the husband is at war. In "Femininity in War", three pieces also focus on a women’s duty to her children. The two blogs center on this single tradition of women—caring for children. Enlist by Fred Spear is connected to a work in Joy’s blog—The Mothers by Kathe Kollwitz. In The Mothers, several women huddle together to protect their children from attack. The children remain underneath the protection of their mothers. This is related to the mother in Enlist, who cling to her young baby as they gradually sink to their death. The women only think about the safety of their children. The artists of both works show that despite the current war, the perpetual duty of a mother to her child still exists. The themes of the both blogs highlight the life of a mother, her will to do her work instead of joining the war and its continuous existence in times of war.